7th October 2018 - (Google Translate) Amazing! The number of patients in Minamisoma municipal general hospital is announced 29 times as much as before adverse thyroid and, leukemia rising by 10 times. In March 2013 I was sent this resin encapsulated sample of a black fungus like material, to test. A contact in Japan had sent a friend this sample. The test chart below shows it was very hot. It had reportedly been collected from somewhere in the Minamisoma area of Japan. This fungus started growing on the concrete and rock surfaces in Japan, after the Fukushima Nuclear disaster. The test results indicted the fungus was bio-accumulating Cesium. I didn't know the weight of this very small sample, and had posted the test results, for discussion on an internet forum. "I'm an expert on weighing objects (sell scales, use different ones daily, some precise to .01g). Fungus in that form does not appear to hold too much water weight and would likely weigh less than a gram given the scale. If it is thin and flakey type fungus, it may be under .25-.5g. Is it thick like a mushroom cap or more like lichen? I've only observed extremely thin fungi growing on concrete, and I would err on the very low side. My best guess is .3g." "That means the black fungus sample from Japan is very, very, hot. 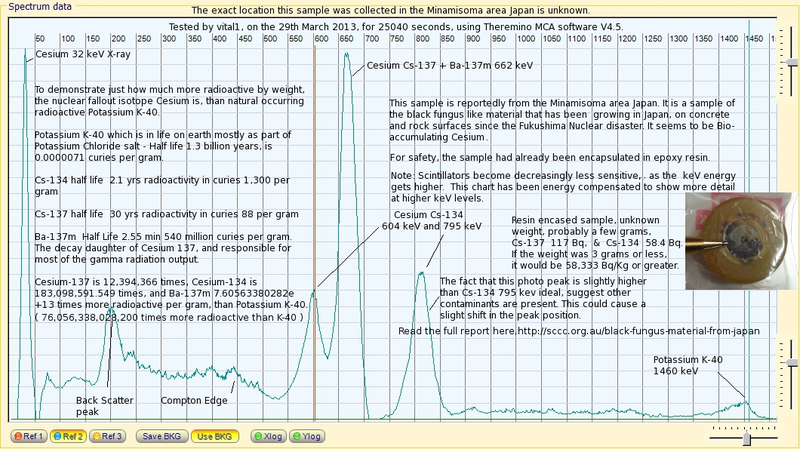 Even if it was 10 times greater in weight 3 grams, it would still be 58,333 Bq/Kg of Cesium."